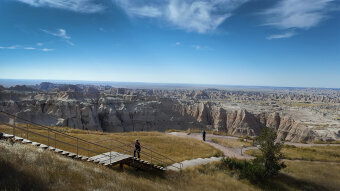 Get a taste of wild and rugged South Dakota on one of our newer bike tours. 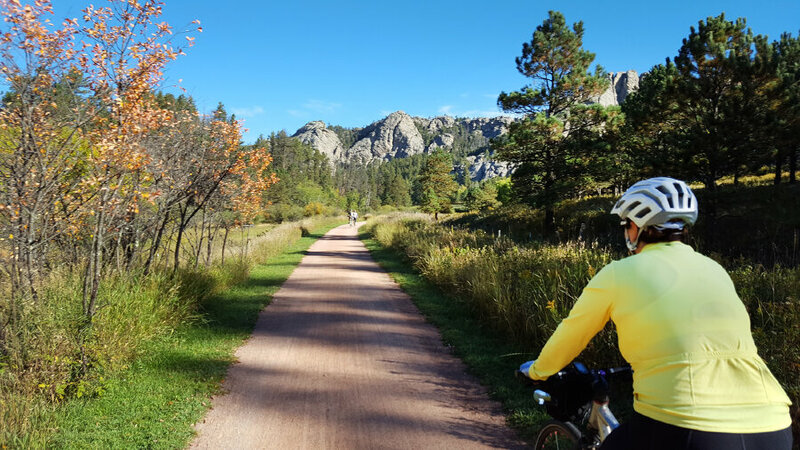 We cycle through some of the most beautiful sections of the state, including Badlands National Park, Black Hills National Forest and Custer State Park. The area teems with wildlife. We'll cycle on the Mickelson Trail bike path and see such iconic sites as Mount Rushmore and Crazy Horse. We've had requests for this tour for years, so we're thrilled to be offering it now! A mix of flat and rolling terrain with a couple longer climbs on a mix of paved roads and the crushed stone Mickelson Trail bike path. Moderate cycling level. 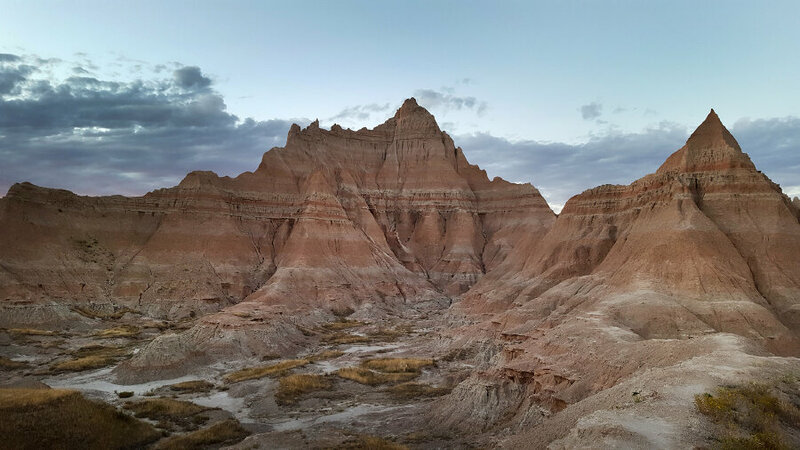 6 nights lodging, 6 breakfasts, 4 picnic and sack lunches, 5 dinners, snacks, entrance fees to Badlands National Park, Mount Rushmore, Custer State Park & the Mickelson Trail, detailed cue sheets, van support & trained guides. $195 - for a hybrid rental bike. If you bring your own bike for the tour, it should have tires at least 28c wide. Fly in and out of Rapid City, SD. Our starting hotel has a complimentary shuttle from the airport. Or drive and leave your car at our starting hotel for the week. At the end of the tour, WomanTours will shuttle you back to the airport by 1:00 or the starting hotel by 1:30pm. 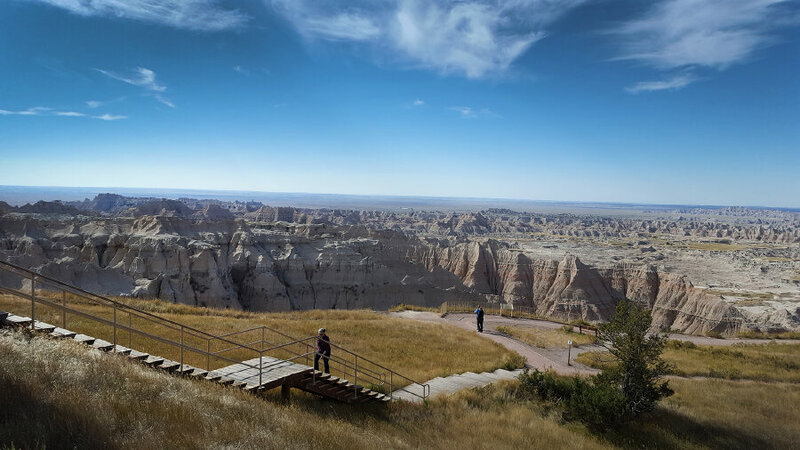 "The cabin in Badlands Park, while not luxurious, had all the comfort and necessities - in addition to a spectacular view from the front porch. 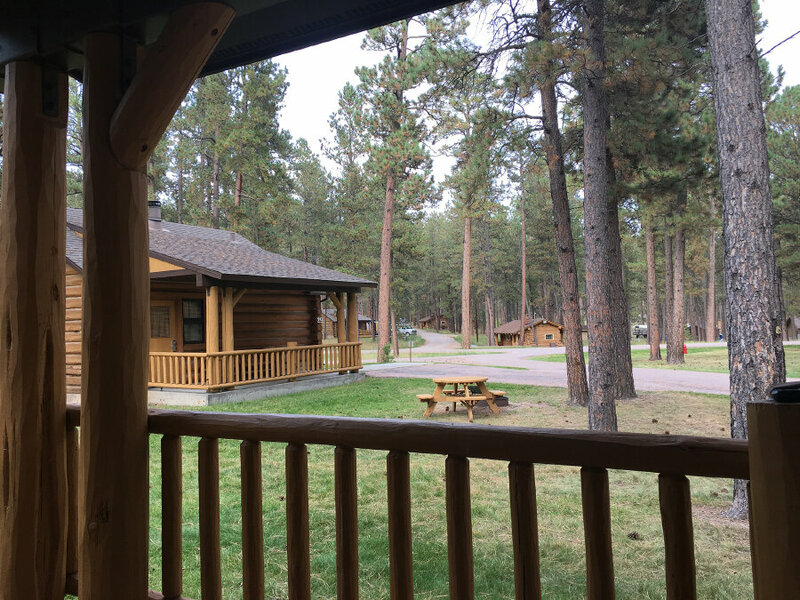 And the cabins in Black Hills were really nice and enjoyable to be in - loved the cabins!" Day 1: We meet in the heart of Rapid City, SD. 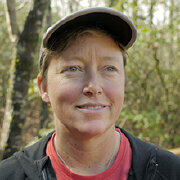 Our rental bike fitting will be at 3:00pm, an orientation at 5:00pm and then dinner together at 6:30pm. If you get a chance, take a walk through the quaint, historic downtown. Every corner displays one of the American presidents, memorialized by a beautiful life-sized bronze statue. 0 miles. Day 2: After breakfast, we’ll shuttle out of the city and into Badlands National Park. 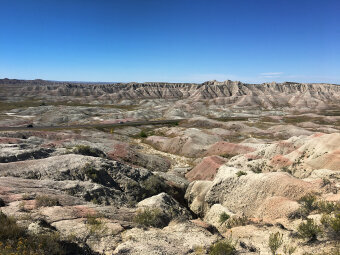 We’ll cycle down beautiful Badlands Loop Road through rock formations that are believed to have been the bottom of a sea 50 million years ago. We’ll ride past grasslands and prairie dogs and end at the park’s visitor center. There you can learn how the layers of sedimentary rock formed over millions of years and caused the spectacular striations of color that we just cycled through. We’ll overnight in the park. 22 miles. 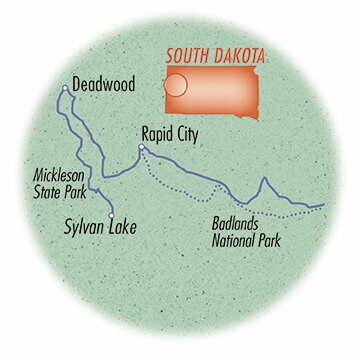 Day 3: After a shuttle this morning, we will cycle through Black Hills National Forest to the town of Deadwood. 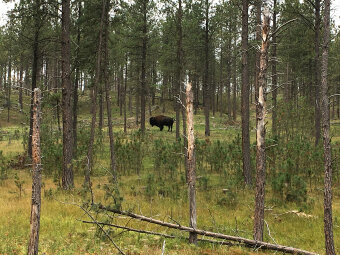 The ponderosa pine forest rises out of the plains and is a haven for wildlife such as deer and turkeys. During the gold rush years, Deadwood was known for lawlessness, drinking and gambling, giving it the reputation as being the wildest town in the west. We’ll have dinner above the spot where Wild Bill Hickok was shot in the back while playing poker. 26 miles. Day 4: We’ll start riding right after breakfast on the George S. Mickelson Trail. Named for the former state governor who helped create it, the rail trail cuts through the heart of the Black Hills with more than 100 bridges and four tunnels. We’ll stop for a picnic lunch along the way and then finish in Hill City, SD. This town is perhaps known best for once being described as, “the town with a church on each end and a mile of hell in between!” If you like trains, you can visit the local train museum before dinner on your own tonight. 47 miles. 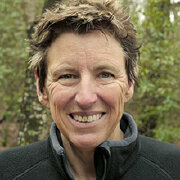 Day 5: We continue our ride on the Mickelson Trail today. Our first sight will be Crazy Horse, a massive carving in the side of a granite wall. Begun in 1948, the work in progress is slated to be 500’ high by 600’ wide. Crazy Horse is the Lakota Sioux warrior responsible for defeating George Custer’s army in 1876. Next, you’ll see “Midwest’s Largest Bicycle Sculpture,” but what might well be the largest bicycle sculpture in the world. It only gets bigger every year, so you’ll have to judge for yourself! 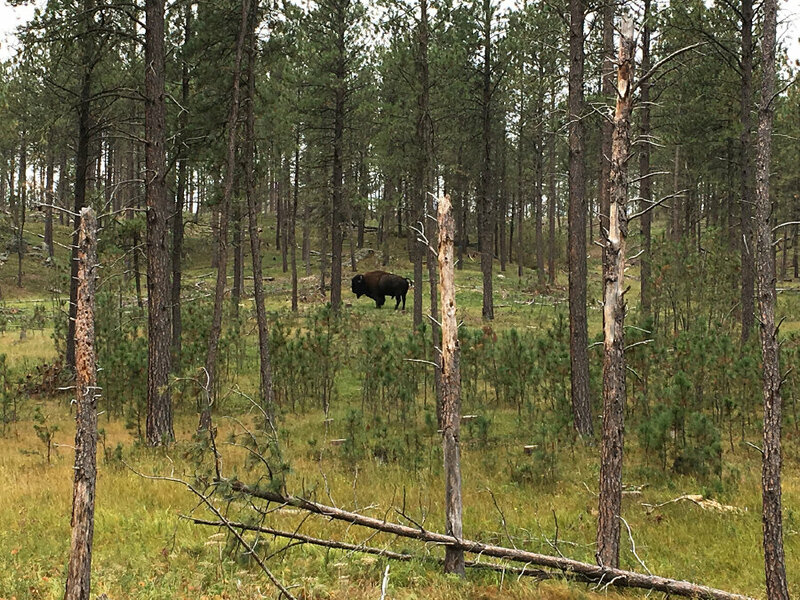 We’ll end our ride in Custer State Park surrounded by a wildlife preserve full of bison, bighorn sheep and antelope. You’ll have time in the afternoon to enjoy a hike or rent a kayak at Sylvan Lake, as we stay overnight in the park. 29 miles. Day 6: Our last ride of the week may be our most beautiful. We start down Needles Highway, named for the stunning rock formations and then continue onto the Wildlife Loop. The wild burros are so tame that they stick their noses into car windows looking for snacks. You’ll also pass by a prairie dog town, the habitat for the animal that resembles a squirrel more than a dog. We’ll have our last picnic lunch on the road today and celebrate our tour of South Dakota at our final dinner tonight. 39 miles. Day 7: We’ll end our tour with a shuttle back to Rapid City, but not without stopping at Mount Rushmore National Memorial along the way. The huge heads of Presidents Washington, Jefferson, Roosevelt and Lincoln carved into the granite are a sight to behold. We’ll arrive at the airport in Rapid City by 12:00 noon and back to our starting hotel by 12:30pm. 0 miles.